We’re all familiar with the flashy, big-ticket organs: the heart, the brain, the lungs. Their celebrity often obscures the work—humbler, less heroic, but often no less essential to the maintenance of a life—performed by those organs only doctors know about: the body’s back-up players, pulsing and pumping in relative obscurity. Not to mention the mid-tier organs, like the gallbladder, whose functions most of us only dimly comprehend, unless—or until—they start acting up. Still, however crucial some of these organs and other body parts might be, there is a hierarchy—which means, inevitably, that one of them is at the bottom, expendable in a pinch. To find out which piece of the body that happens to be—what, in other words, the least essential chunk is—for this week’s Giz Asks we reached out to a number of anatomists and evolutionary biologists. The first organ I’d give up would be the gallbladder. Gallbladder removal (due to gallstones) is one of the most common surgeries, and people do fine without a gallbladder. The liver makes bile, and bile can drain directly into the intestine to help digest fats. The gallbladder acts as extra storage space for bile and it contracts to add more bile when we eat a particularly fatty meal. People without a gallbladder have to be careful not to eat too much fat at one time or they may experience abdominal pain, nausea and vomiting. After that I’d go with the spleen, which is part of the lymphatic system of the body and helps fight infections. Sometimes it gets damaged, such as in a car accident, and has to be removed. People do well after spleen removal, but may be more susceptible to serious infections. Next: One kidney. Healthy people do not need two kidneys. Lastly, the left lung. Lung capacity in healthy people is greater than is needed, even during exercise. The left lung is the smaller of the two, so it is more expendable. But living with only a right lung may decrease exercise capacity. After that I begin to feel quite possessive of the remainder of my organs. It’s hard to pick just one! The human wrist is a clunky hodgepodge of unnecessary bones. If we could design that joint from scratch, there is no way we would stick eight small, fixed, and mostly useless bones in there. We also have the stump of a tail that we could totally do without. It does nothing for us except occasionally gets injured or develops cancer. I think my favorite useless body part is the pyramidalis muscle, which is located in our pelvic floor and attaches to the pelvis and some other connective tissue in our nether regions. What does it do? Well, when you flex this muscle, you can sort of squish the tissue in that area around pointlessly, but in monkeys and other mammals, it helps to manipulate the tail. So useless is this muscle that at least 20% of us don’t even have one and we don’t even miss it. I always enjoy telling people that, although humans and other apes don’t have tails, we still have the muscles to flex them! My mind immediately goes to a few muscles that are so tiny, they are effectively useless. In our forearm, there is a muscle called palmaris longus. It spans from the base of our arm (humerus), crosses the elbow and the wrist and inserts onto a thick band of tissue in the palm of our hand called the palmar aponeurosis. It technically can help flex our forearm at the elbow and hand at the wrist, but it is so puny—most times it is just a thin ribbon of tendon—that its contribution to these actions must be negligible. In fact, about 15% of people won’t even have it—if you flex your wrist and cup your hand, you may see two prominent tendons pop out in front of your forearm just before the wrist. On the side closer to your thumb, you should see the prominent tendon of flexor carpi radialis. If you don’t see a tendon next to it on the pinky side, you may not have palmaris longus. In our leg, there is a little muscle called plantaris. This muscle comes off of the base of our thigh bone—the femur—and joins the rest of our calf muscles to contribute to the Achille’s tendon. It has a small muscle belly behind the knee, but for the most part, this muscle exists as a tiny tendon sandwiched between the much larger calf muscles—gastrocnemius and soleus. It is so uninspiring that surly professors call it the “freshman nerve,” because it is often misidentified by first year medical students as a nerve. That said, I shouldn’t be so negative towards these muscles, which may serve a purpose after all: they are often harvested by surgeons for tendon or ligament reconstruction surgery. All organs are useful! But as for which are the most useful, and which are the least: From an evolutionary perspective, we think about survival. 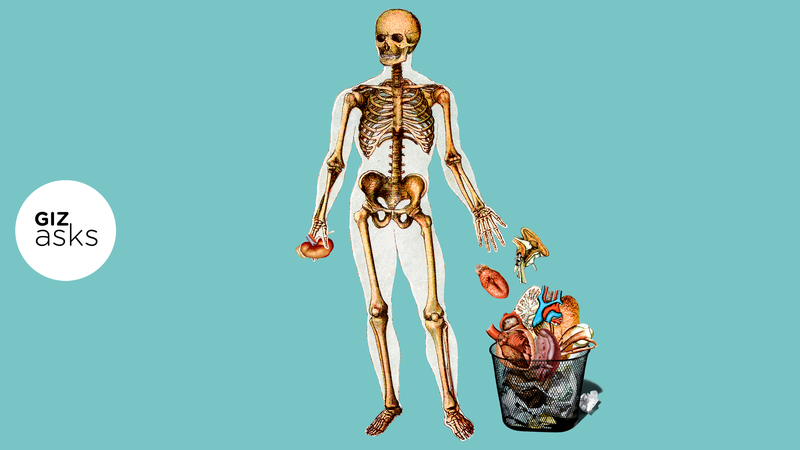 If the organ were removed, how would it affect our ability to function, and to survive? We often talk about positive selection (something that makes you better at survival and reproduction), but turns out that most selection is negative selection (that is, something it would be very, very bad to lose, and so is kept around). For example, most every organ is maintained in the body because without it, we have poorer chances of survival. This is all that negative (or purifying) selection is. It’s like your car. There are a lot of ways your car can break, so you spend time maintaining everything and just keeping it going—this is similar to purifying selection on features in the human body. We spend time trying to maintain things, and that depends on the environment. Do I need snow tires in Arizona? Nope, so cars here won’t have snow tires. But is having snow tires useful in Minnesota? You betcha. And cars without engines won’t work in any environment, and won’t go on to having baby cars... well, you know what I mean. It’s easy to say which organs are the most useful, because without them we won’t function as humans in any environment. But the least useful organ in the human body depends entirely on your environment. So, maybe sweat glands are less useful for someone who lives their whole life in the arctic, but essential for a person in the Savannah. And, maybe tonsils, which are part of the body’s immune system, are less useful when we have a wide array of antibiotics, but in regions where people don’t have access to antibiotics, tonsils could be extremely useful. We could think about hair (which grows out of our skin, a HUGE organ); we can survive without it, but is it useful? Yes. Hair plays both a role in warmth, keeping particles at bay (eyelashes and nose hairs! ), skin protection, or even mate choice (how we get huge societal differences). So, I think it’s actually far easier to say which is the most important organ, and far more messy to say which is the least important.